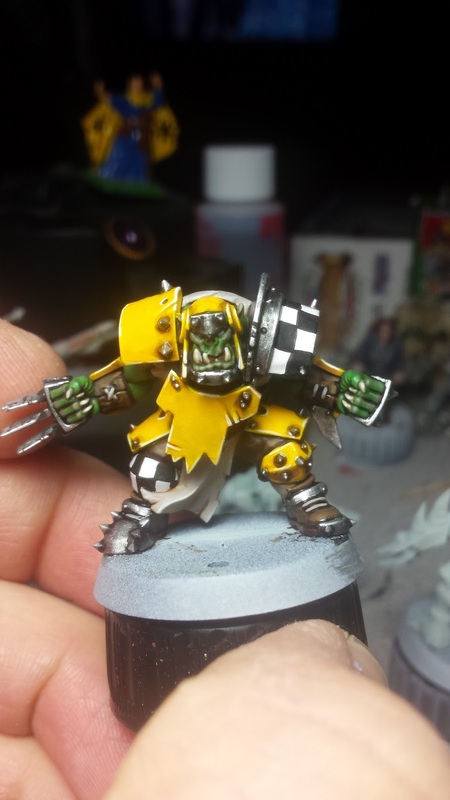 With the model in 2 pieces, I started painting the skin first. I knew I wanted to stay away from a cartoony green and that it needed to be a bit more believable. I also didn't want it too dark, so Caliban Green and Warpstone Glow were out of the question. 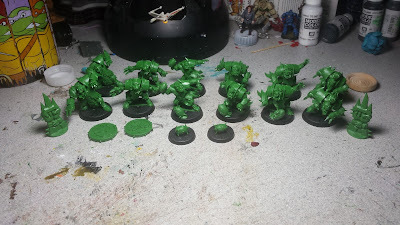 For this I started with a base coat of Warboss Green and then a wash of Riekland Fleshshade. This was followed by a touch up coat of Warboss Green, before adding in some reddish pink of a Reaper MSP paint sample I don't have a name for. Then, for the face I mixed in a little Reaper MSP Fair Skin to the mix for the lips and highlighting on the cheeks. Finally I did a quick go around with some Agrax Earthshade in the recesses where clothing met the skin tone, to help give it some more definition. 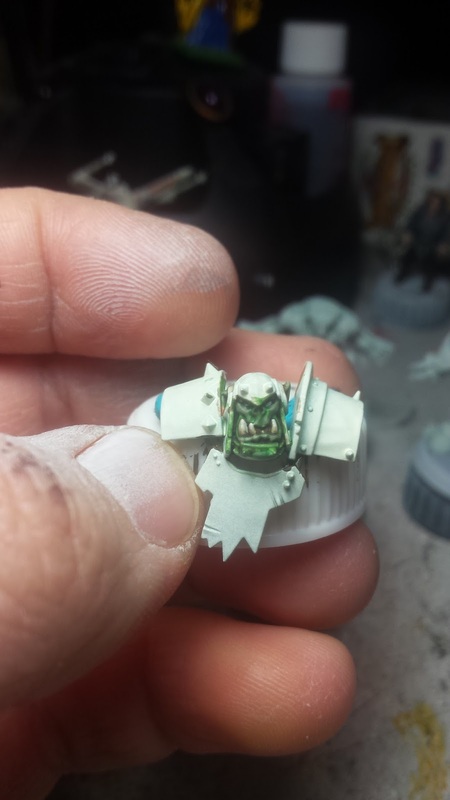 Unlike the Humans, which I skipped painting their eyes, I painted the test Orc's eyes white. I may not end up doing pupils, but it looked odd not having something there. The teeth and fingernails were painted pretty simply. All that I did was paint them with Screaming Skull, a wash of Agrax Earthshade, a touch up and then a highlight of white. 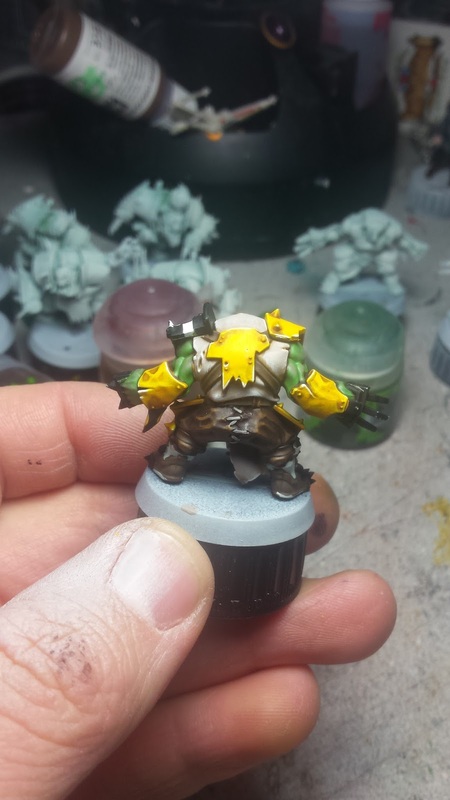 The clothing had me stumped for a little bit, but in the end I decided on brown paints and tan shirts.This looks really good with the green skin and I'm glad I went that route. It did mean I needed to rethink the brown for the leather strapping, but that wasn't a huge deal either. 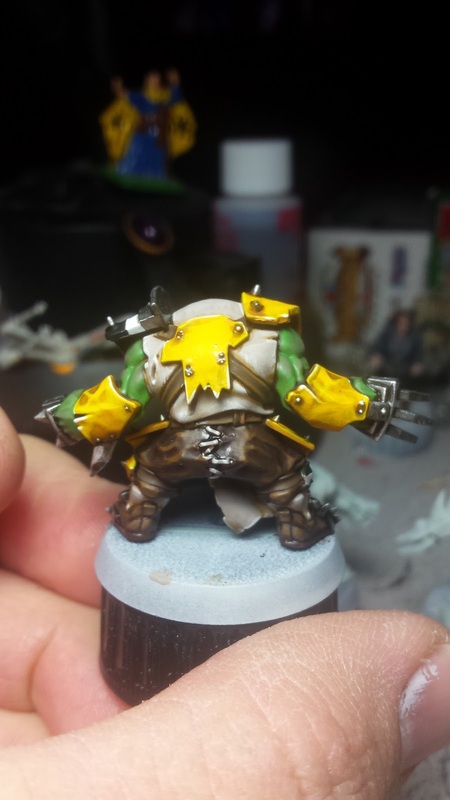 The pants were painted with Rhinox Hide, washed with Agrax Earthshade, touched up and then highlighted with a mix of Rhinox Hide and Vallejo Earth Brown and a highlight of just Earth Brown. The shirt was done with a base coat of Rakarth Flesh, washed with Seraphim Sepia and then touched up and highlighted with a mix of Rakarth Flesh and Pallid Wych Flesh. Then edged with straight Pallid Wych Flesh. Finally it was time to paint the armor plating. Up until this point I was still on the fence as to the colors I was going to go with. I knew I wanted to do some checker patterns on a few spots, but the main color was the problem. I originally planned to go with yellow, then decided to go black, then blue. At one point I thought of all silver armor and then just rusting the hell out of it. Finally, it all came back around to yellow again and that's what I ended up going with. After touching up the yellow sections with some white, I painted a few coats of Yriel Yellow on the armor plating. This was followed by a wash of Agrax Earthshade and then some touch ups of Yriel Yellow. I then painted any shadowed areas Averland Sunset and washed them with Agrax Earthshade. The highlight was painted with Flash Gitz Yellow edge highlights and then another edge highlight of White. There's still a bit to go, and he's actually not glued together yet. I still need to paint his metal sections, the socks and finish up all the leather strapping and shoes. Then I have to do a bit of weathering on him, because what self respecting Orc walks around in pristine gear? That's it for now though, keep an eye on Twitter and Instagram for updates while they happen. Also, like the Humans, expect at least a few more WIP posts on here as I work through the team. I've since finished off the test model and decided that I should add the finished pictures to this post, rather than post another one with little information. Also, I started on the skin tones for the rest of the team. Well, most of them. 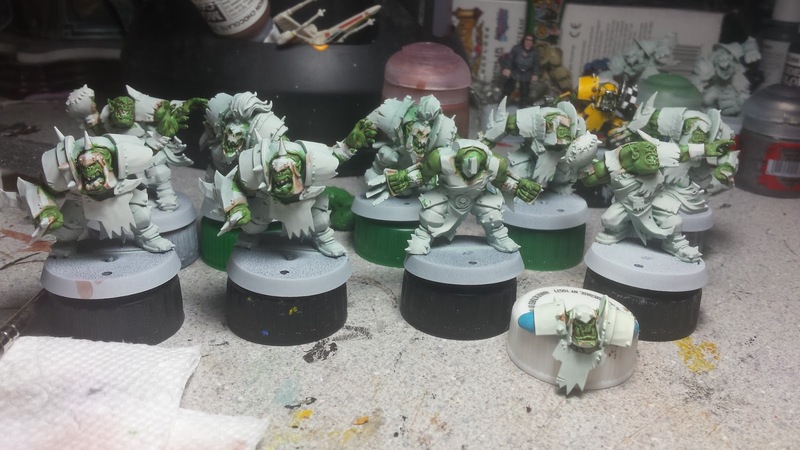 I am painting the Black Orc Blockers with a different skin color, since they are technically a different type of Orc. I had to stop after the first wash step though, because it was taking awhile for the wash to dry. Very nice work. The touches with the check pattern break up the yellow well. Thanks! 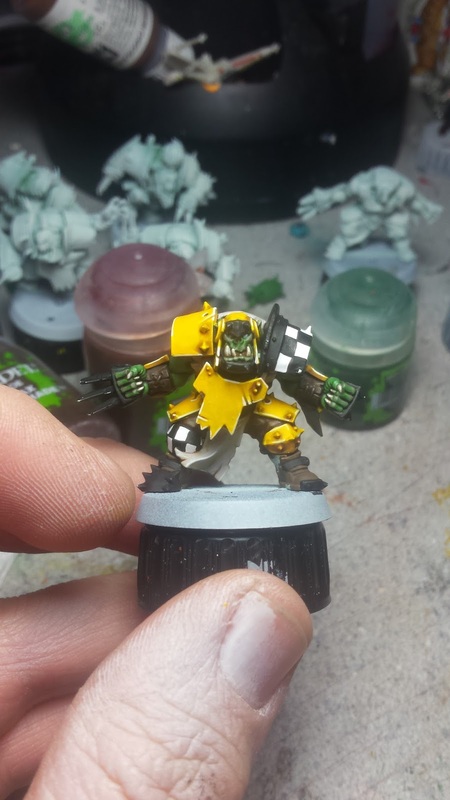 I'm glad I stuck with the yellow and while I'm happy with the checkers, I wish they were a bit smaller. Thanks! And ya if I ever do more of these models I am leaving the head/shoulder sections loose. 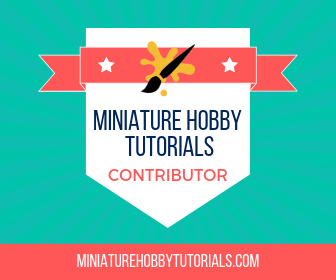 They look awesome, but the assembled mini really hurts doing a clean job.